US President Donald Trump makes his first overseas visit this weekend, beginning in the Middle East and continuing to Europe. His tour to the "holy land" is being presented with feel-good, messianic spin. Trump touches down first in Saudi Arabia, then will go Israel and from there make a pilgrimage to Bethlehem in the Palestinian territories. After his stop at the reputed birthplace of Jesus, the American president will then fly to the Vatican, where he will be greeted by Roman Catholic Pope Francis. He will later meet NATO military leaders in Brussels. Getting ready for my big foreign trip. Will be strongly protecting American interests — that's what I like to do! 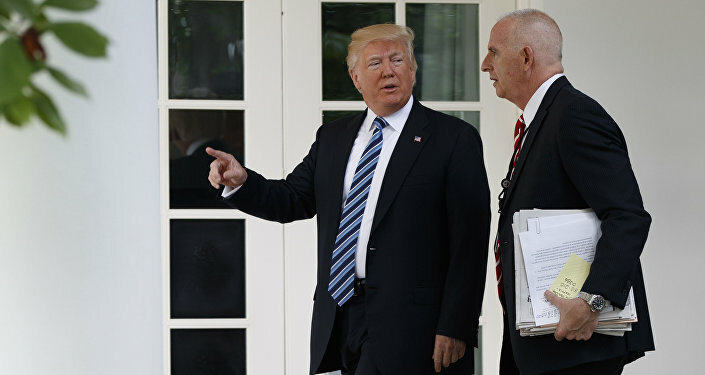 Presenting the president's Middle East itinerary like a momentous religious event, Trump's senior national security adviser General HR McMaster said: "This trip is truly historic. No president has ever visited the homelands and holy sites of the Jewish, Christian and Muslim faiths all on the same trip. And what President Trump is seeking is to unite peoples of all faiths around a common vision of peace, progress and prosperity." The White House, reported the Washington Post, described it as "an effort to unite three of the world's leading religious faiths in the common cause of fighting terrorism, reining in Iran and unifying the world against intolerance." Hold it. Screech the brakes on this Hollywood-type script of Saint Donald saving the world. What utter claptrap. The main purpose of his sojourn is to cut a record arms deal with Saudi Arabia and the other closely aligned Gulf Arab monarchies. While in the Saudi capital, Riyadh, addressing regional leaders about "world peace," Trump is set to sign off weapons deals worth $350 billion. That's more than double what his predecessor Barack Obama flogged to the Saudi rulers during his presidency. According to Bloomberg, topping the list of US arms transfers are warships, helicopter gunships, anti-missile systems and tanks. 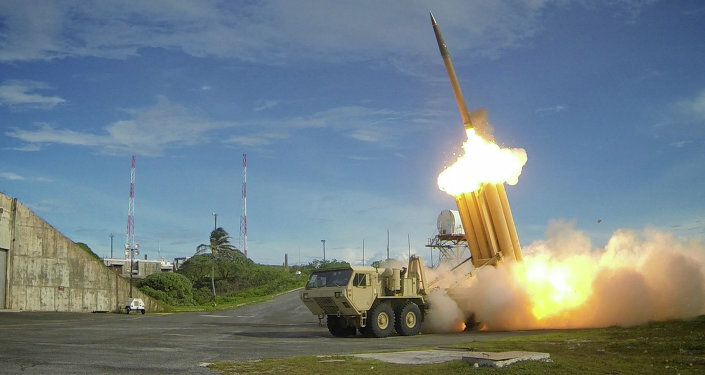 The THAAD anti-missile system, recently debuted in South Korea, is said to be among the inventory for the Saudis and other Gulf states to the tune of $10 billion. The crisis in Korea provides a convenient sales pitch to the Saudis. 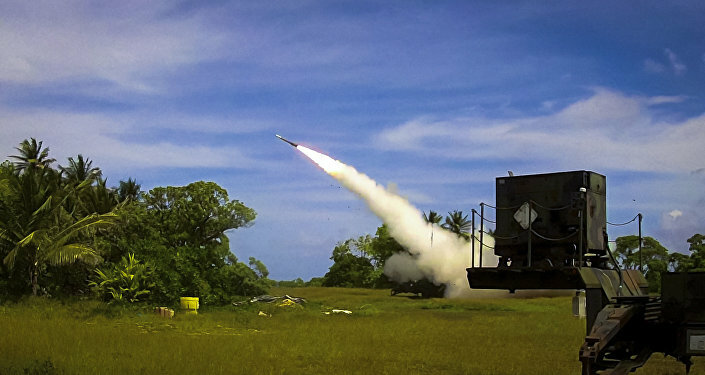 Maybe that's partly why the Trump administration has dangerously provoked the tensions in Asia, precisely to push through their THAAD sales in the Middle East. In addition to the weapons purchases, the Saudi rulers are also promising to invest $40 billion from their oil-rich sovereign wealth funds in American companies. Jared Kushner, Trump's son-in-law and personal adviser, has been instrumental in lining up the mega sales, in conjunction with the Saudi deputy Crown Prince Mohammed Bin Salman. The 30-year-old son of King Salman, who is also the defense minister, has been courting the Trump presidency ever since the election last November. The Saudi prince, known as MBS by the Trump inner circle, is the chief strategist behind the Saudi war on Yemen since March 2015. That war is a blatant aggression on Yemen carried out by Saudi forces supplied by the US and Britain. Thousands of children have been killed in Saudi air strikes, using internationally banned cluster bombs in indiscriminate attacks on civilian centers. Just days before Trump's departure to the Middle East, Saudi air strikes reportedly killed 23 civilians, including six children, near the southern Yemeni city of Taiz. Millions of other Yemeni children are dying from starvation and preventable diseases like cholera because of a naval blockade imposed on the country by Saudi and American forces. No doubt the new warships that Trump is lining up for Saudi Arabia will add to the "efficacy" of the genocide that is underway in Yemen. With staggering cynicism, the Trump administration is "justifying" this ramped-up military support for Saudi Arabia as an effort to "fight terrorism" and to "counter Iranian meddling" in the region. It is alleged that Iran is sponsoring militia in Yemen, Syria and Iraq and this is posing a threat to regional stability. Such claims are an insult to common intelligence, when we know that it is the American CIA and their Saudi client regime who have bankrolled and directed terrorism across the entire Middle East over many years in order to serve hegemonic interests of regime change. But what is disturbing is just how braindead the Trump administration is. Trump is recklessly promoting the ridiculous fantasy that Saudi Arabia and its despotic terror-sponsoring clients are somehow the custodians of law and order. He is also pumping up the surreal Saudi narrative that Iran is largely responsible for the Middle East's conflicts. When the American president addresses Saudi and other Muslim leaders in Riyadh this weekend supposedly on the challenges of finding regional peace, two nations are banned from the gathering – Iran and Syria. Saudi rulers have recently threatened Iran with fomenting a Syria-style proxy war inside Iran. The record arsenal of weapons that Trump is bringing to Saudi Arabia will only embolden its House of Saud tinpot dictators to pursue even more confrontation with Iran. Much of the small-arms weaponry that the Americans supply to Saudi Arabia already ends up in the hands of terror groups like Jabhat al Nusra and Daesh (so-called Islamic State). There are perplexing signs that the US under Trump is ratcheting up military aggression toward Iran and its ally Syria. This week, US warplanes reportedly attacked Syrian armed forces and Iranian allies Hezbollah in southern Syria. It was the second such direct assault on Syria after Trump ordered Tomahawk missile strikes on the Shayrat airbase in April. Syrian sources claim that the latest US air strike was carried out to protect militants being trained by American special forces inside Syrian territory. Those militants, known as Maghaweer al Thawra, are part of the Al Qaeda terror network, according to independent journalist Vanessa Beeley in email correspondence with this author. Seems more than coincidence that the latest US operation was timed with Trump's departure for Saudi Arabia. This is the kind of military action that the Saudis were constantly pushing the Obama administration to carry out. The strike on Iranian interests too will no doubt endear the new US commander-in-chief even more to his Saudi clients. 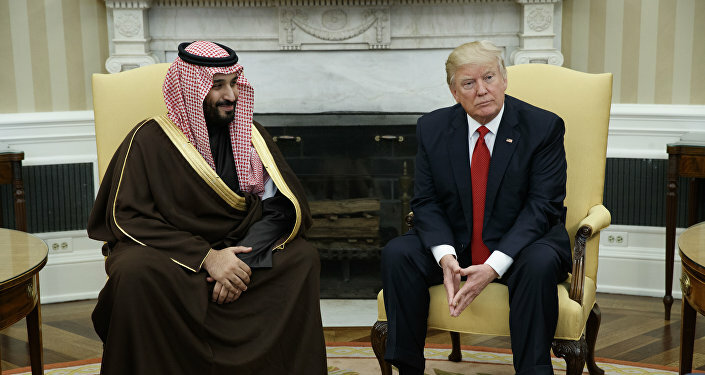 Trump's messianic zeal to visit the Middle East – his first foreign destination being the dubious human rights "haven" Saudi Arabia – is all about flogging ever more deadly weapons to the already explosively-charged region. So desperate is Trump to pimp billions of dollars that he is willing to fuel war with Iran and perhaps Syria's other ally, Russia, in the pursuit of lucre. And to add further insult to injury, the whole tour of the "holy land" is being sold by the American government and media as some kind of benevolent religious duty to mankind and world peace. The only "gifts" that Trump is bringing to Bethlehem and the region are ever more monstrous ways to murder children. If Pope Francis had any integrity, or even news savvy, he should cancel Trump's call at the Vatican, and explain exactly that child-killing regimes are not welcome.